Campaigning for a Mayor or any local elected official is a zero sum game right? Your guy or gal either wins all or loses it all. Your tireless nights and weekends door-knocking only add up to a win or a loss. This weekend two of my neighbors returned from door knocking looking a bit defeated from their conversations. One of them expressed "Most people just wanted to talk about things that could be fixed using SeeClickFix." This got me thinking a bit and I started asking others about their canvassing experience. My neighbors' experience was not unique. Right now there is an army of civically engaged people going out of their way to talk to neighbors. Many of the conversations are about the blighted building, the illegal dumping in the park, or street light that has been out for months. Why not turn that army of door-knockers into neighborhood surveyors? What better way to open a conversation about improving the neighborhood than helping a neighbor get a long standing issue resolved? In a time when many neighbors respond with 'I'm saving my vote as all politicians are the same.' why not build some trust and show them that local government can work? 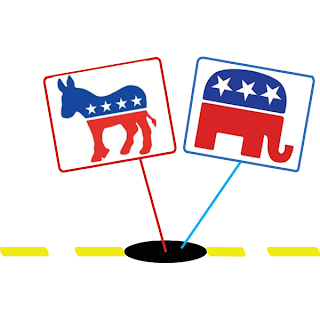 Instead of focusing on campaign politics and positions, which often puts people on the defensive, this tactic centers around concrete issues (no pun intended). Even if your candidate loses, your work will not be lost. Your neighbors will feel more empowered and your neighborhood will be improved. The more we thought about this the more we realized we should offer to train folks from all campaigns on how they could go about stumping with SeeClickFix. Maybe it will help your guy or gal win. Definitely it will help improve the community... and that's why you're out there anyways. If you're on a campaign or are thinking about joining one, join us in person at the SeeClickFix office or online for a special SeeClickFix campaign training session this Wednesday at 4:00 PM. To join, sign up for the Webex here or shoot us an email! No, not those billboards: something even better. After our recent partner launch with New Westminster, British Columbia, an awesome resident there took time to send us this even-more-awesome photo. No, that is not Photoshopped. 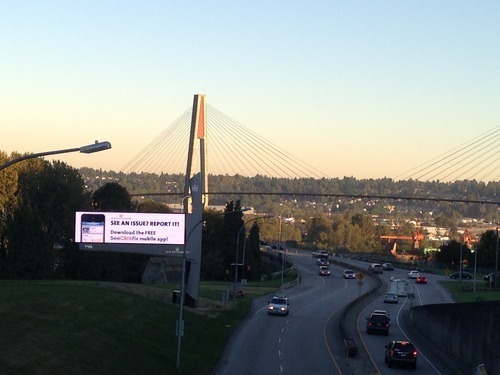 People driving in New Westminster can see SeeClickFix's very first highway billboard placement asking drivers & residents to report local issues through the apps. This is a pretty great Wednesday. Last week Chicopee, MA unveiled their participation as a Commonwealth Connect partner! Citizens in each of the communities can put an app on their smartphone and go to our web site and basically hone in on their problem. For example, if you have a pothole on your street, take a picture and send us your address. It will go right to DPW and a work order will be created,” says Mayor Michael Bissonnette. It’s part of a system called Commonwealth Connect and it costs the city and its residents nothing. I'll be filling this weekend with two awesome TED experiences revolving around The City. Tomorrow is the TED City2.0 event at the NYTimes Center in NY. On Saturday I'm speaking on "Potholes as the gateway drug to civic engagement." at UCONN TEDX. At TED City2.0 I'm excited to hear Eric Liu, of Guiding Lights Network take the stage. Eric has been gracious to include us in his Citizen University events around the Country and I always enjoy listening to him talk. We've made a great number of connections through his bi-partisan network of civic activists. It will be beneficial for all of us as Eric expands the network with TED. Eric also was a speech writer for Bill Clinton and is one of the most inspiring people I have heard on a microphone. As an advisor to the Code For America Accelerator I'm also very excited to hear Catherine Bracy talk about the expansion of CFA internationally. CFA puts technologists inside city hall to help solve municipal problems and they've done a great job of getting attention for the civic tech space domestically. The world can not get enough CFA. On election day last year I had the pleasure of being on a phone call with Secretary of Housing Sean Donovan. Secretary Donovan ignored the politics of the day and spent his hours working with private and public entities to try and help those displaced by Hurricane Sandy. Sean will be speaking tomorrow as well and I'm really excited to hear what drives him. Of utmost importance at these events is a healthy representation from the public and private sectors. Janet Sadik-Khan, Director of Transportation for NYC, will also be speaking. Over the life of the Bloomberg Administration she has shown us how public officials can disrupt the norm from the inside. New York City is a different place because of Sadik-Khan and if you like bicycles, walking and slower traffic...a better one. TEDCity2.0 is very much focused on people and people's effects on the City. Many City2.0 conversations are focused on the "Smart City" which includes conversations about 'citizens as sensors,' but mostly focuses on smart grid technology and the network of smart machines that will make our cities 'better.' I think this is interesting but not nearly as interesting as the creativity that passionate humans are investing in our cities to make them more interesting and sustainable. Street performers, architects and aural public space artists will all be in attendance and if I have not said it enough yet...I can't wait for tomorrow. Tonight will be a bit like Christmas Eve. On Saturday at TEDX UCONN I'll be focusing on stories from SeeClickFix users where citizens have stepped up to help out their neighbors and neighborhoods. Not only by speaking up to let governments know that there's a problem but also by helping to solve some problems on their own. Citizen painted crosswalks, neighbors lending their homes to others in a tragedy and neighbors helping to plow a driveway are some of the points I'll hit. We've been getting more connected to UCONN's computer science department through our wonderful summer intern Zach Dicesare and I'm exited to spend a bit of time in that community. I love that TED is shining such a large magnifying glass on The City. Wonderful things are happening to neighborhoods all over the world. I can't wait to hear about them this weekend. TED CITY2.0 will be lived streamed here. TEDX UCONN will be live streamed on Saturday here. Here's my "Love the Town Your With." Presentation from TEDx Yale last year. We talk a lot about transparency and accessibility--everything from connecting neighbors to having the tools to easily communicate and connect with your government & fellow residents. Now, there are even more ways for more people to do just that. We are proud to announce new languages on SeeClickFix mobile. While we've had support for multiple translations of the site from the web for some time, now it's available in French, Spanish, and Portuguese in your pocket and on your streets. If the default language for your device is set to French, Spanish, or Portuguese, SeeClickFix (as well as our many apps for partners) will automatically be completely translated when you open it. This is fantastic for anyone who lives outside of the United States, spends time traveling abroad, or anyone anywhere who just doesn't "do" English. We promise more to come, and we'll bring more languages even faster with your help--so please contact us if you'd like to be a part of it. And, of course, if you haven't already, go download the apps here. If you read our last blog post, you know that we are constantly in awe of the ways in which residents go above and beyond to help one another with issues they collectively find important. We wanted to highlight a few reports that capture the caring sentiment one would hope to see in all neighborhoods and communities. The following issues all involve a pet, but as Ben mentioned in his post yesterday, we consistently see this level of involvement in a diverse collection of reports. 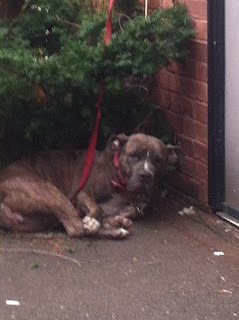 It took a network of community members to help this dog and shed light on its history. Around a week later, another example of great neighborhood communication and involvement surfaced on the site. This report about a loose dog in New Haven is awesome because the communication amongst neighbors started before the report was put up on SeeClickFix. The individual who posted about the dog hadn't even spotted the pet herself—she had received a text message from another individual who had seen the dog and she felt compelled to publicly share the information. The first comment revealed that the dog, who had been in the care of a community member when the report was posted, had transferred hands and was with an individual who was putting up "Found Dog" postings around the internet. The dog's owner was found the same day and the individuals who had helped along the way expressed their delight that the dog was reunited with its family. We were also happy to see a neighbor who hoped to collect the owner's contact information so that she could directly get in touch should the dog ever get loose again. The final post we would like to share with you is about an elderly cat named Tom. After he went missing, his owners submitted a report. Tom's owners commented that they would pick him up after work. Turns out he is eighteen years old! We love all of these examples of community teamwork and look forward to seeing many more posts that exhibit such exemplary qualities of the human spirit. I wanted to reach out and say thank you. A few times recently I've been caught off guard with a feeling of euphoria because of actions taken by neighbors, documented on SeeClickFix. Each of these actions belongs to an issue that gets archived in my Gmail under the semi-lame label 'cool issues.' While the reported issues are many times very different--from a loose manhole cover to an abandoned pet--the resulting conversation is what elicits the emotion for me. The common thread in the response that seems to get me is that one or many people are jumping into assist on an issue where the issue reporter did not ask for their help or intend them to be the primary responder. We all have heard the stories of entire neighborhoods that sat idly by while a person screamed for help. It is awesome to know that the community that I get to work with every day is not that community. I'm convinced that the majority of you are the folks that will be the first to run out in the street to help push a stalled car--or the third if you see that the first two helpers still could use more hands. The Financial Times Writing on SeeClickFix! Over in New Haven – once famed for its arms manufacturing and, of course, Yale University – SeeClickFix presents another urban action scheme, in this case to report and repair minor urban irritations, such as potholes and broken street lamps. This is very much in the model of New York’s broken window experiment (fixing vandalised infrastructure to deter further criminal damage). A neglected-looking city attracts crime and decay faster than one that appears pristine. We've seen plenty of awesomeness come out of Burlington, Vermont over the course of SeeClickFix. From animal issues to general responsiveness to great cycling advocates, Burlington is a poster city for progressive, transparent, community action. But this takes it to a new level. With all the beds and couches dumped and promptly cleaned up (heck, even surfboards), you might think it'd be a sore spot for the folks in Burlington. Turns out, exactly the opposite: to celebrate their Art Hop event taking place last weekend, the Code Enforcement department created their own couch, covered in turf, with pillow-case collages of all the couches they've previously removed. This is a hall-of-famer for sure. Reported by one, "Arthur Hop", we were incredibly excited to see such creative, clever, and inspiring work be a part of Burlington's South End Art Hop, and honored to have it included on SeeClickFix. Welcoming New Westminster, BC as the Newest SeeClickFix Partner! New Westminster – The City of New Westminster has launched a new mobile device application for city residents. See Click Fix enables residents to report non-emergency issues such as potholes and graffiti to city staff from their smart phone. Available for free, the See Click Fix app enables smart phone users to conveniently report issues they see around the city by choosing an issue category to report, taking a photo of it and providing any other relevant details all at once. The See Click Fix mobile app also tags the specific location of the issue through the user phone’s global positioning system, making it easy for city staff to respond. Once submitted, the report is forwarded to the appropriate city department for action and staff can provide updates on the status of the issue until it is “fixed”. See Click Fix can be downloaded for free in the app store for iPhone and Android users. See Click Fix reports can also be made through the City website, on the City of New Westminster Facebook page at facebook.com/newwestminster, and through SeeClickFix.com. About: The purpose of the competition is to be able to quantify and predict how people will react to a specific issue. What makes an issue urgent? What do citizens really care about? How much does location matter? Being able to predict what the most pressing 311 topics are will allow governments to focus their efforts on fixing the most important problems. The data set that will be provided for the competitions contains several hundred thousand 311 issues from four cities. Read more about it and sign up here! Charleston, IL (September 4, 2013) - Today, City Manager, R. Scott Smith, announces a new program that will allow residents to report quality-of-life issues and request the City of Charleston services through an online and mobile interface. Powered by SeeClickFix, the place-based reporting platform allows residents to document neighborhood concerns and improvements alike, ranging from litter and flooding to damaged sidewalks and malfunctioning traffic signals. Smith says, “With the online and mobile reporting platform, residents can report quality-of-life concerns through service request categories via the City of Charleston website, mobile applications (iPhone, Android), Facebook App, and SeeClickFix.com. When submitting issues via mobile app, for example, residents can provide locational, descriptive, and photographic information as they see the issue in real time. Once the resident submits an issue, the reporter, the City of Charleston, and anyone ‘watching’ the area will receive an alert. The City of Charleston can then acknowledge the service request, route it to the proper department, and update the request—and residents following the issue—once it’s been resolved. The City of Charleston SeeClickFix website can be found here: www.charlestonillinois.org and residents can download iPhone and Android apps here: http://www.seeclickfix.com/apps. SeeClickFix allows citizens anywhere in the world to report and monitor non-emergency community issues ranging from potholes and planted trees to garbage and graffiti. Launched in 2008, it empowers citizens, community groups, media organizations, and governments to work together and improve their neighborhoods. Through mobile web, web, iPhone and Android apps, the SeeClickFix platform is the most widely distributed citizen-reporting tool in the country. SeeClickFix supports the Open311 standard that promotes improved communication between local municipalities and the citizens they serve. The platform is fun and easy to use for citizens while being inexpensive and easily adaptable for governments. Over 60 percent of issues reported on SeeClickFix are ultimately resolved. For more information or to report an issue, visit www.seeclickfix.com. It's September, so with that it's (of course) time to send out our August press shoutouts from the world of SeeClickFix. For starters, there's the Henry Daily Herald talking about our new partner Stockbridge, Georgia. Joining our many friends in the state of Georgia, we were thrilled to announce this new addition. The Patriot Ledger, serving communities south of Boston, joins in and lets its readers & viewers report and track issues directly from their website here. UT San Diego covers our friends Chula Vista officially launching SeeClickFix. Charleston, Illinois gets announced just in time for their announcement last night. And finally, Alexander Furnas over at the Sunlight Foundation mentions SeeClickFix in his piece about creative effective transparency policies. Did we miss something? Leave it in the comments. Writing a story about SeeClickFix? Go ahead and contact us.